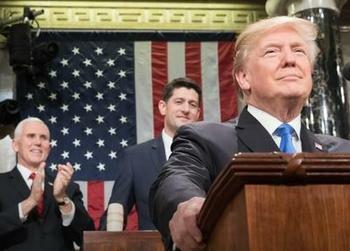 WASHINGTON, DC, January 31, 2018 (ENS) – To hear President Donald Trump deliver his first State of the Union Address to both houses of Congress last night was to realize that for him the environment does not exist. Or, he would like the American public to ignore what his administration is doing to the environment. The president said not one word about environmental issues, although his administration has opened the Arctic National Wildlife Refuge and most of the U.S. coastline to drilling for oil and gas, increasing the risk of damaging oil spills. Trump administration officials have weakened protection of public lands, opening them to drilling, and have cut roughly by half the size of two National Monuments created by President Barack Obama. Now, the U.S. Environmental Protection Agency plans to dump existing Clean Air Act protections at hundreds of American industrial facilities that limit pollution of the air by arsenic, lead, and mercury and other chemicals. Desired by the oil and coal industries, these changes would allow “major” polluters now subject to existing regulations to be reclassified as “area” polluters, opening a loophole for facilities to increase emissions. “Weakening limits on such pollutants would raise the risk of cancer, brain damage, infertility, and developmental problems, especially for communities near these facilities,” warns the environmental group Natural Resources Defense Council. Far from combating climate change, the Trump administration is repealing President Obama’s Clean Power plan without any replacement plan to reduce the largest source of carbon emissions in the United States from existing fossil-fuel-fired electric power plants. On January 29, the public interest environmental law firm Earthjustice joined with other groups in calling upon the EPA to withdraw its proposal to repeal the Clean Power Plan, because the proposal reflects the improper involvement of EPA Administrator Scott Pruitt. A similar request was made January 9 by a coalition of state and local governments. Another threat to the environment is hidden in the part of Trump’s speech in which he promised to renew America’ infrastructure. infrastructure investment we need,” said Trump. “Every Federal dollar should be leveraged by partnering with State and local governments and, where appropriate, tapping into private sector investment – to permanently fix the infrastructure deficit,” he said. “Any bill must also streamline the permitting and approval process — getting it down to no more than two years, and perhaps even one,” said the president. And by selling off American public lands. A draft of Trump’s infrastructure plan leaked to the news outlet Axios January 22 indicates that he would sell off public lands to accomplish his goals. The infrastructure plan calls for the “Disposition of Federal Real Property” by executive order, making clear its intention to sell America’s public lands. “This plan calls for the disposal of federal lands, it’s right there in black and white,” warned Rokala. Part of Secretary Zinke’s political persona is his opposition to transferring or selling off public lands, she said, a position now in conflict with his role in the Trump administration. Yet, since becoming Interior Secretary, Zinke’s commitment to protecting public lands and opposing transfers or sell-offs has been often in doubt. 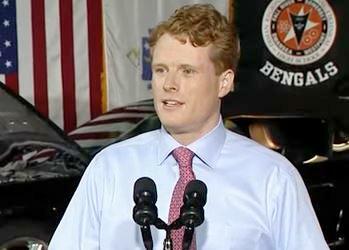 In answer to Trump’s neglect of the environment in his speech, Representative Joseph P. Kennedy III, Democrat of Massachusetts, delivered his party’s official response on Tuesday night. Speaking from Diman Regional Technical School in Fall River, Massachusetts, the third-term Congressman didn’t say much about the environment, but the one statement he made was strong. Neither man said anything about climate change – the issue that nearly all world leaders and scientists are convinced with the greatest danger facing humanity.